The below artworks are the most important in Socialist Realism - that both overview the major ideas of the movement, and highlight the greatest achievements by each artist in Socialist Realism. Don't forget to visit the artist overview pages of the artists that interest you. Artwork description & Analysis: In this work - whose title is also translated as "Give Us the Heavy Industry" - we see five men toiling in a steel factory. The work is hard; they are wearing leather to protect themselves as they struggle bare-chested towards a vast flame. The glare from the fire occupies a large corner of the canvas, but the men are clearly the subject of the work. Their profiles show stoical expressions; they are unflinching in the blistering heat. In the background, other men push coal towards enormous furnaces, while an open door revealing a cityscape beyond reminds us of the people who will benefit from their labor. 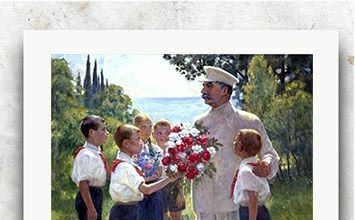 Stylistically, the piece is a striking blend of Socialist Realist motifs and Pimenov's early avant-garde influences, typical of the early period of the movement. 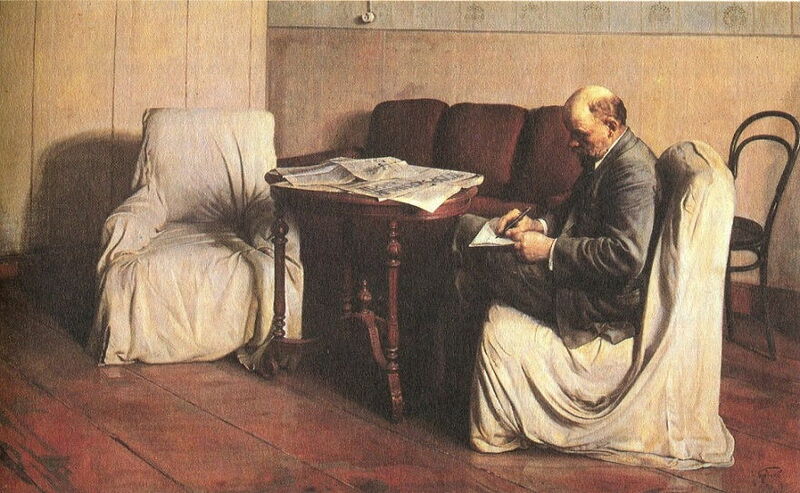 Artwork description & Analysis: Brodsky's portrait of Lenin, one of the most iconic works of Socialist Realist art, depicts Lenin at the Smolny Institute, the headquarters of the revolutionary government in the months immediately following the October Revolution. All the details of the scene are intended to contrast with the excessive opulence of Tsarist Russia, from the dustsheets thrown over the chairs in the makeshift office to Lenin's humble attire and expression of calm concentration. Standing at nearly three meters high, the canvas presents the leader as almost life-size, enhancing the quality of naturalistic accuracy which pervades the work. The rendering of the polished wood of the furniture, the texture of the fabrics, and the gleaming floor, show Brodsky's technical talent - the piece is almost photographic in its accuracy. Artwork description & Analysis: Yuri Pimenov's 1937 painting places the viewer in the back of an open-top car cruising through central Moscow, a female driver at the wheel. All around is progress: cars are everywhere, a tram moves towards new high-rise buildings, while an entrance to the new and much vaunted Moscow subway is visible to the side. Scattered across the scene like flecks of color, busy people hurry about their day. Layers of symbolic imagery can be detected beneath the everyday surface of the image; the red flower propped on the windshield of the car, for example, indicates the artist's support for the Soviet Government. Artwork description & Analysis: Standing at nearly three meters tall, Aleksandr Gerasimov's monumental double-portrait shows Joseph Stalin accompanied by his faithful ally Kliment Voroshilov, one of the original five Marshals of the Soviet Union (the state's highest military rank), a prominent figure in Stalin's government and frequent subject of Gerasimov's paintings. Indeed, Nikita Khrushchev would later remark that Voroshilov spent more time in Gerasimov's studio than attending to his political duties. In this painting, however, he, like Stalin, seems a model of concentrated attention. The pair mimic each other's postures in a show of unity as they walk alongside a Kremlin tower. The men appear deep in conversation, their forward glances signifying a focus on the Soviet Union's bright future. In the background, barely visible, the proletariat form a line outside a factory. Artwork description & Analysis: This work, also known as "Grain", depicts a lively scene of activity on a collective farm or Kolkhoz. A group of women smile and talk as they work the harvest, holding shovels, tying bags, and carrying grain; a central figure rolls up her sleeves, standing tall and proud with a beaming smile on her face. Dominating the composition is a large pile of grain waiting to be transported, whose presence adds to a warm color-palette suggesting optimism, dynamism, and vitality. Artwork description & Analysis: In this image we see a mother and her young children gathered in an open doorway, reading a letter from a father or brother at the front, brought home by a fellow soldier sent presumably on recovery leave. The happy group smile alongside the injured friend in uniform, the cheerful optimism of the scene complemented by the bright colors of the sky and the sunlight which drenches the village square, bathing the children's faces in light. The piece pulsates with warmth, suggesting little of the anxiety and trauma which would presumably have accompanied such a meeting. Artwork description & Analysis: After the Second World War, communist rule spread to several countries in eastern Europe - a group of satellite states which became known as the Eastern Bloc - while revolutions in Asia, including in North Korea and China, brought the culture of Soviet Socialist Realism to Russia's Eastern neighbors. In this picture celebrating the conclusion of the Chinese Civil War of 1945-49, we see many of its tenets replicated. Chairman Mao addresses his people in Tiananmen Square during the inaugural ceremony of the People's Republic of China on October 1, 1949. Behind him stand a group of officials looking on while the warm reds and golds of the Chinese lanterns hang heavy with national and political symbolism. These contrast sharply with the blue sky, in which doves fly, signaling a bright and peaceful future (the day had in fact been gloomy and overcast). Lanterns are presented as symbols of prosperity, while chrysanthemums represent longevity. It is painted in a folk-art style, using bright contrasting colors that would appeal to a Chinese aesthetic.